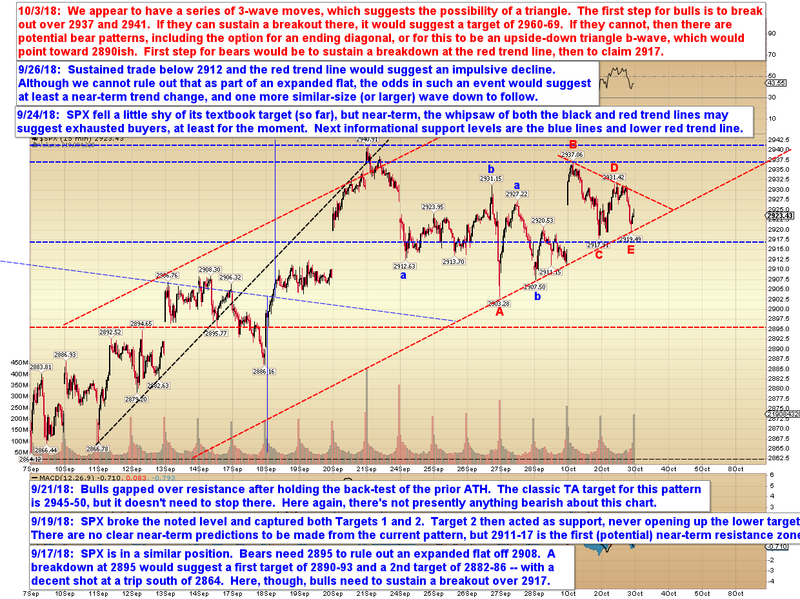 Pretzel Logic's Market Charts and Analysis: SPX Update: Potential Triangle? Since last update, the pattern has turned into an overlapping chop zone, which suggests the possibility of a triangle. For once, all the subwaves fit for a triangle pattern (each subwave in a triangle needs to break down into a 3-wave (or corrective; WXY works too) move, and the subwaves on this pattern appear to do exactly that. 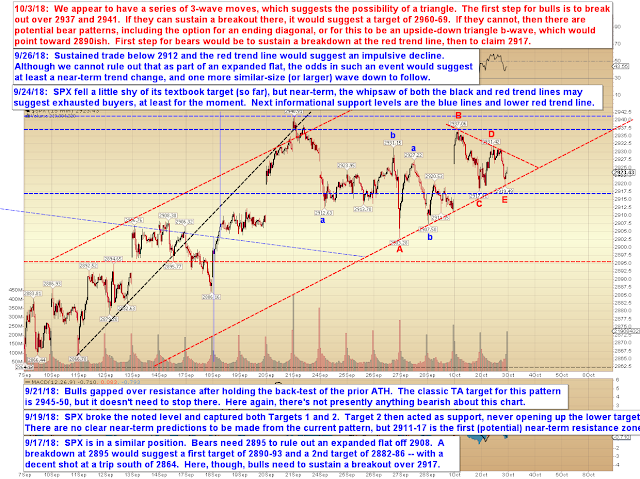 The question then is whether it's a bullish triangle (more common in this position) or a bearish b-wave triangle. The bearish b-wave would likely only be near-term bearish, as it would suggest a c-wave down to follow the current move, and then new all time highs. Of note, INDU has already its September high, and most of the time that means SPX will follow soon thereafter. Of course, the pattern could yet develop in a way that renders the bear triangle moot and turns into something more bearish -- we'll just have to see how the next couple sessions develop. In conclusion, we do have some clear levels to watch for the next couple sessions, and some potential targets if those levels are broken. Also worth noting that if this IS a bull triangle, it would suggest that the next rally will be wave 5 of (something), since triangles are almost always the penultimate wave in a waveform, which could then turn into a decent correction after the upwards thrust completes. Trade safe.